Continuing the momentum following Andretti Autosport’s 1 – 2 finish at the epic 100th Running of the Indianapolis 500, the team’s partnership portfolio continues to grow with the addition of Magneti Marelli, a global advanced systems and component supplier for the automotive industry. The partnership also further strengthens the race team’s technical capabilities as Magneti Marelli and Andretti Autosport will be collaborating on a number of development and engineering projects to optimize the race team’s performance. The first appearance for the brand will come through primary sponsorship of Carlos Muñoz and the No. 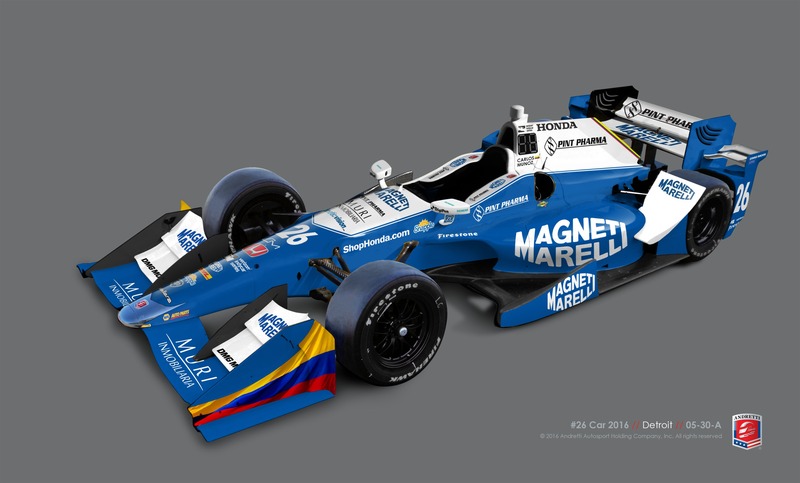 26 Magneti Marelli Honda for the Verizon IndyCar Series Duel in Detroit on June 4 and 5 and associate sponsorship of Marco Andretti and the No. 27 Snapple / United Fiber & Data Honda for all remaining races on the 2016 IndyCar schedule.